Got to see different age crocodiles. The show & feeding was the best part! Hard to enjoy if you don’t really like crocodiles. We didn’t mind seeing it & thought it was ok.
A must see farm when in langkawi to view some various different sizes from baby to adult crocodiles. It is complete with food outlet and shop to serve the tourists and local visitors. There is Q & A answer show session and feeding time which is very interesting. The whole farm is well maintained and clean, with clear indication of the species. it is a site worth recommending !!! This is a good place to experience for young kids. There is a Q&A session and crocodile show. Before you enter, please ask the time of the show… you should not miss that. I think that’s the star attraction. The rest is just like a crocodile zoo…. Also known as Taman Buaya Langkawi, is spread across 20 acres and situated near Datai Bay, just 32km north of Kuah. It houses one of the largest numbers of crocodile and alligator species gathered together in the world. Here, reptiles range from newborns to world record-holders, including Bujang Kawi, the oldest croc born without teeth: he weighs over 454kg (1,000lbs) and is over four metres long. Kids will enjoy the new born, to growing, to adult crocodiles. You can see the crocodile feeding at the timings specified. Reach there at 2:30pm to see all activities. Do not miss the live show in the pond with experts. Nothing quite compares to an afternoon spent in the company of its more than 1,000 crocodiles: watching, feeding, and fearing these reptiles will make for an unforgettable day out and a trip here is practically a must. Finally we were glad to see the souvenir stores to get your croc mementos in purse, shoe or other forms – a darkly funny touch. You can get your family photo with a dummy croc at the entrance. Go there only if you are crocodile lover or you want to teach your child about crocodile, else nothing much for adult viewers. This farm is far from main Langkawi townships on the way to temurun, so no market around, only shop in croc farm only sells non veg, so vegetarians be prepared. Good part that it is quite clean, no smell and very well maintained park. Fees is little bit on higher side as it does not have much to look around, quite small compared to the entrance fees. just 30-50 minutes enough except the shows. There are 2 shows, feeding show and one croc fighting (which are not croc fighting, just 3-5 min croc circus). same good for children, not much for adults. Confirm timing of the show before going there which I think is around 2:45 PM. 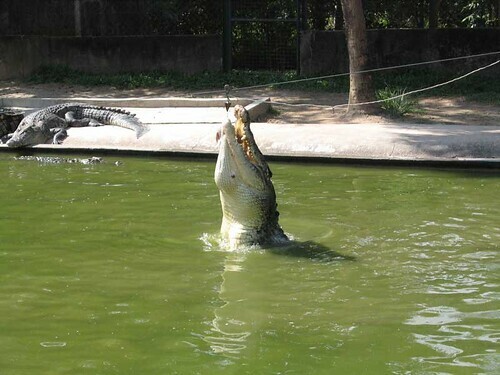 When you are visiting Langkawi Island, the crocodile farm is one of the tourist attractions that you must not miss. Why? Because there are hardly any places in the Malaysia that houses such a number of these giant reptiles. The Langkawi Island crocodile farm is the place to go if you like watching these remarkable reptiles. This is probably one of the few crocodile farms in Malaysia that keeps and breeds these creatures for their skins, meat and for tourist viewing. The farm easily has over 1000 crocodiles of varying ages. A close up shot of this incredible creature. I was actually kind of excited having the chance being in close distance with these formidable monsters. Without fear, I couldn’t wait any longer to pay an entrance fee of RM20 so that I could get pass the entrance without further delay. Upon entering, the first thing I noticed was the farm was huge. I could see many of pens with crocodiles inside separated from visitors by water moats and high concrete walls. As I walked by each pen, I took a peek at these scary creatures lying lazily in the shades. Most of them were lying in pack whereby it’s kind of scary to see that piles of scales and long tails. Some of the crocs kept their mouths open for better ventilation and the sight of their sharp fangs made them seem menacing. As I walked further, I reached a concrete bridge with high railings spanned across a pond for visitors to view the crocodiles in a more close-up manner. I could see these creatures directly above them. Some of them were actively swimming in the pond while others were lying motionless in the shade. The handler introduced some of the crocs to us, poking at them with his bamboo rod. Some crocs were provoked by the handler’s act and they snapped the bamboo rod like a toothpick! A croc was seen jumping out of the water to grab the meat. On some occasions, I spotted some older crocs with tougher skin, a sign of their maturity and some have even lost their teeth. But don’t be deceived. Even without teeth, they can still pack a crushing bite! Some group of crocs were born with missing legs or a tail. We were told that they would not survive long if they were kept in the group with the normal breed because they would not be able to fight for food with their disabilities. One particular interesting croc was that it has a crook snout which has been separated and kept in a special pen. This croc requires special diet with boneless meat and it is already 20 years old and were given a name. Moving away from the adult crocs, I reached some smaller pens with younger crocodiles that were separated by age. These baby crocs were kind of cute since they resembled house lizards. A crocodile with a crook snout which has been separated from the rest. From the sign board, this one has lost its survival ability which makes it hard to be kept with other crocodiles. While the farm doesn’t offer special performance, the daily feeding time should be worth watching. It must be thrilling to see the crocodiles respond to natural instinct and feed. If you were lucky enough and arrived at the right time, you will be treated to a feeding show where you will be seeing these creatures fighting to tear their preys into pieces. For a mere entrance fee of RM20, I feel that it is pretty much worth the money to see these magnificent reptiles. Upon headed for the exit, I developed a healthy respect for these remarkable creatures. The crocodile had hardly evolved since time immemorial and they resembles the dinosaur the most that once roamed the earth. Lastly, there is a souvenir shop where you will find some of the finest products such as boots, purse, wallet, belt and so on that are made of crocodile skins. The price is very steep though ranging from a few hundreds of ringgit for a wallet to a few thousand ringgit for a pair of crocodile skin boots! They come with a certificate certifying that these are genuine crocodile skin products and are made at a legal crocodile farm. For a great selection of places to stay with discount prices visit Langkawi Hotels for more information. For more pictures of Langkawi Crocodile Farm, please visit the following flickr photostream. I love crocodiles. They are amazing creatures.